Food bloggers unite and do good! Another holiday season rolls around, and with it comes Chez Pim’s 4th annual Menu for Hope fundraising raffle project. This year’s money will be given to the UN World Food Program, and earmarked for the school lunch program in Lesotho, Africa. Last year, this event raised over $60,000. Food bloggers from around the world donate amazing prices, and $10.00 buys you one ticket and one chance to win any of these prizes. The event runs from December 10-21, prizes are announced on January 9. 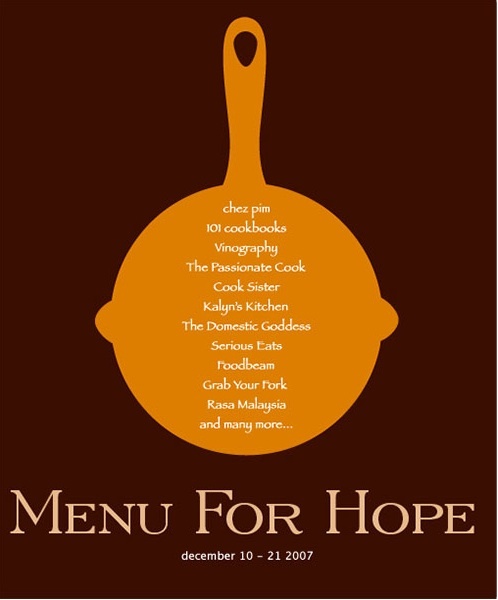 For more info on Chez Pim’s Menu for Hope 4: click here. 1. Choose your prize or prizes from one of the many prizes from Pim’s Menu for Hope prize post. Take note of the prize number(s) you are interested in. donate will give you one raffle ticket toward a prize of your choice. for EU02. Please write 2xUW33, 3xEU02. information so Menu for Hope can claim the corporate match. you in case you win. Your email address will not be shared with anyone. Wednesday, January 9 for the results of the virtual raffle. I’m hoping that next year won’t be as topsy turvy as this year so that Aroma Cucina can donate to this very worthy cause. That doesn’t mean that I won’t be buying some raffle tickets of my own! Have fun looking through all the prizes.